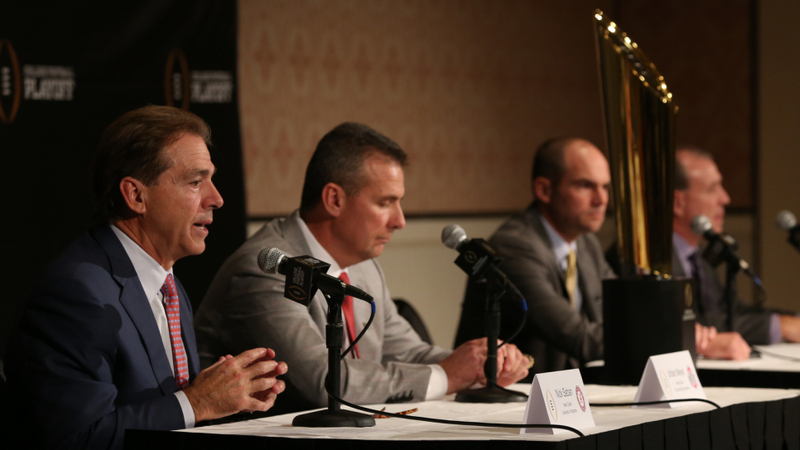 The 2014 College Football bowl games and playoff are set and ready to go. Let’s dig in. A home game for SDSU, I feel that they lack the defensive ability to defend Navy’s dangerous triple option which destroys the clock, giving the Apaches no time to work on offense. The Midshipmen offense gave Ohio State, a playoff team, a real scare during the first week of the season. Fresno State is sitting at 6-7 after their loss to Boise State in the Mountain West Championship Game and has to face a much-improved Rice team. The Owls are actually a good program now and should be able to win this game without much trouble. Rutgers is like Rice, they look so much better than they used to, including a dominating win over Michigan. Even though Michigan was awful this year, Rutgers looked great in that game and they didn’t look all too bad in their first year in the Big Ten. North Carolina has fallen off the map, struggling to even get to a bowl game this year. I love the thought of the high-powered, air raid attach of Central Florida going up against an ACC defense. NC State will put up a fight, but as long as they can limit turnovers I feel like UCF will win this game. Virginia Tech is from the ACC which is the worst Power 5 by far, true. However, I’ll take a 6-6 ACC over an 8-4 AAC team any day, especially when the 6-6 is coached by Frank Beamer. Cincinnati just doesn’t jump out in any way shape or form, while Virginia Tech can say they have a win over a playoff team, Ohio State. Duke is rebuilding from last year’s ACC Championship Game team which mostly graduated. Arizona State looked incredible against Notre Dame and they honestly haven’t looked bad since, except maybe a slightly weak performance against in-state rival Arizona. Two 6-6 teams face off against each other. This game is in essence ACC vs. SEC power and strength. The Bo Pelini firing still makes no sense, he never finished worse than 9-3 at Nebraska. Barney Cotton, the new UNLV Offensive Coordinator, will serve as interim even after hiring Mike Riley from Oregon State. USC should be able to beat a coach-less Nebraska team. Notre Dame just fell apart after losing to Florida State after Corey Robinson’s game-winning TD was overturned due to a Pass Interference by a teammate. LSU, while not as strong, is still a good team. This shouldn’t be too difficult for the Tigers. This should be easy for Auburn, Wisconsin will be without a coach as Gary Andersen has departed Madison for Oregon State. West Virginia fell off the wagon after losing to TCU, while Texas A&M was very close to a Thanksgiving night win against LSU. The Sooners should be able to rebound from a poor performance all-around against Oklahoma State and upset the Tigers. Texas needs to capitalize and make something out of every possible drive to win, as Arkansas loves to hold on the ball and power run it down the field. This could be one of the most entertaining bowl games with the most intriguing matchup being Jake Waters vs. Bret Hundley. The Wildcats’ Waters I feel is much more experienced. With Mason Rudolph under center, the Cowboys look incredible. I don’t see that stopping against Pac-12 Washington. This marks a school-record 9th straight bowl appearance for Oklahoma State. While good, Ole Miss’ land-shark defense doesn’t have the speed to contain Trevone Boykin and the explosive Horned Frogs offense. Jan. 1 – Goodyear Cotton Bowl Classic: No. 5 Baylor vs. No. 8 Michigan State – Mich. St.
Michigan State will likely keep the ball too much of the game for Baylor to do anything. With freedom, the Bears are able to strike quickly, but not so much with pressure on. The Spartans also have a lot more strength and power. Boise State just doesn’t lose big bowl games. Why start now? The Yellow Jackets are much like Navy in that they destroy the clock. Mississippi State will need to force a lot of 3-and-out’s to even have a shot at winning this one. Oregon’s offense is just too much for the Florida State defense who hasn’t faced anybody this season. Alabama is the best football team in the country right now. Ohio State just doesn’t have the power. I expect Alabama to beat Oregon in the National Championship game too.